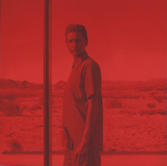 The young American artist known as MPA, who lives in the Mojave Desert, explores the poetic and philosophical implications of colonizing the red planet, Mars, in this enigmatic four-part exhibition. On one recent evening, two gender-defiant dancers in red makeup moved with intensity through the museum’s packed lobby; cutouts in their jeans revealed “moons,” their bare buttocks playing the roles of the Martian satellites Phobos and Deimos. Curious viewers followed the stern, fast-moving performers into a red-lit, black-painted gallery, where MPA’s installation includes moody photo-based works, a red phone (pick it up and a voice questions you about your Mars-based fantasies), and cryptic arrangements of detritus scavenged in the desert, paired with painted wooden dowels. A site-specific piece titled “Long Line” traces a crimson path through the museum; it leads to the third-floor theatre, where MPA will establish a “self-sustaining biosphere” in a ten-day, round-the-clock performance, starting Feb. 9.